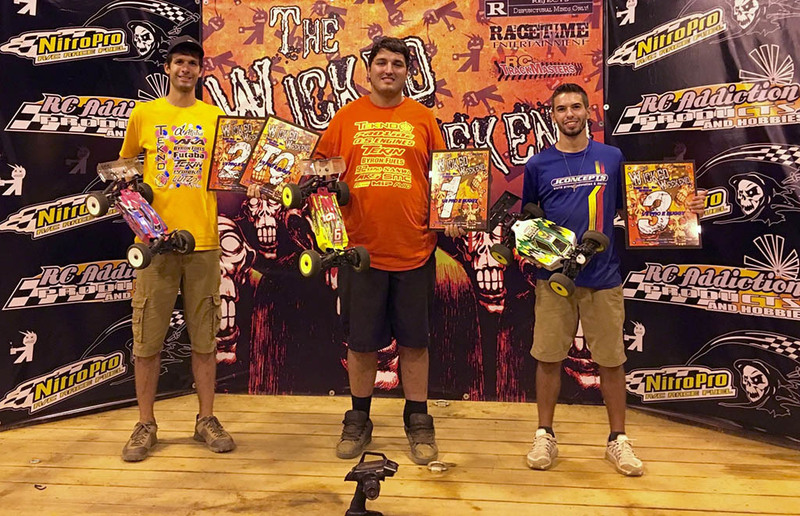 Wicked Weekend Double for Tekno RC! 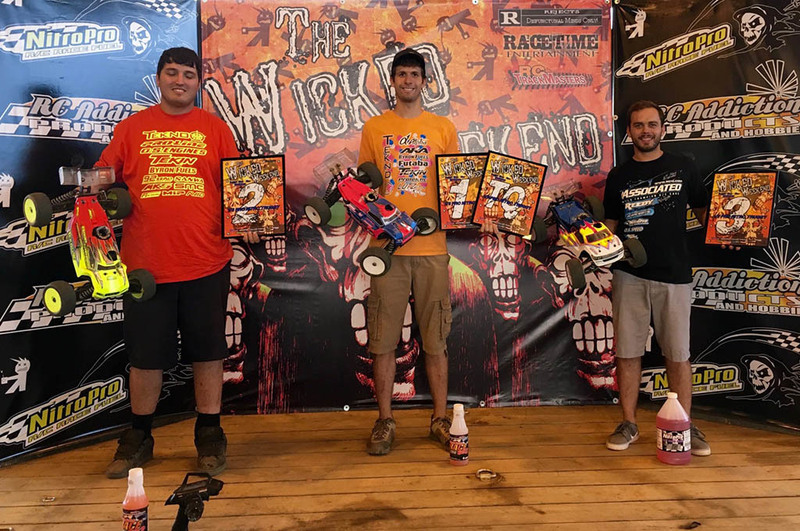 The Wicked Weekend was a success again this year, not only for our drivers and products but for the race event itself. Ryan, Joe, Matt, and 640 entries (a record amount!) were in attendance. This made for long days but the program moved along quickly thanks to the race directing by Lance McDonald. The track layout put in by Bobby Moore was relatively easy and had good flow which provided close racing. Practice went well for us. Not too many changes were needed, mostly we just tried a few different tires on each car and got some good track time in. For qualifying, Ryan seemed to be unbeatable by TQ'ing both rounds of all three classes. Joe struggled a little bit throughout the day but still had some solid runs qualifying 2nd in Ebuggy, 3rd in Truggy, and 4th in Buggy. Brave Tekno team drivers and customers ready for racing at 7am! Main day was pretty layed back. Our races weren't up until decently late in the afternoon so we had plenty of time to prepare. First up was Ebuggy A1. Ryan and Joe had a good battle but Joe edged him out and took the win. Next up was Truggy where Ryan set sail early and left the pack. Joe had some early mistakes but came back to 2nd place late in the race. Ebuggy A2 was another good race with Ryan getting the win, setting up for an interesting A3. In Nitro buggy, Ryan got in the lead early and had a good run going. Joe got sent to the back of the pack in the first lap and had to work his way up. About 12 minutes in Joe had an issue that put him off of the track. Ryan, still leading, would also have an unfortunate issue ending the race for him. Joe got his car fixed and went back out to finish the race and get a little testing in at the same time. In Ebuggy A3, Ryan starting on pole led the first couple of laps and Joe filed in line. Ryan had a slight mistake letting Joe by for the lead and it stayed that way for the rest of the race with Joe getting the overall win and Ryan coming in second. Electric Buggy Results. 1st Joe Bornhorst, 2nd Ryan Lutz and 3rd Matt Cline. 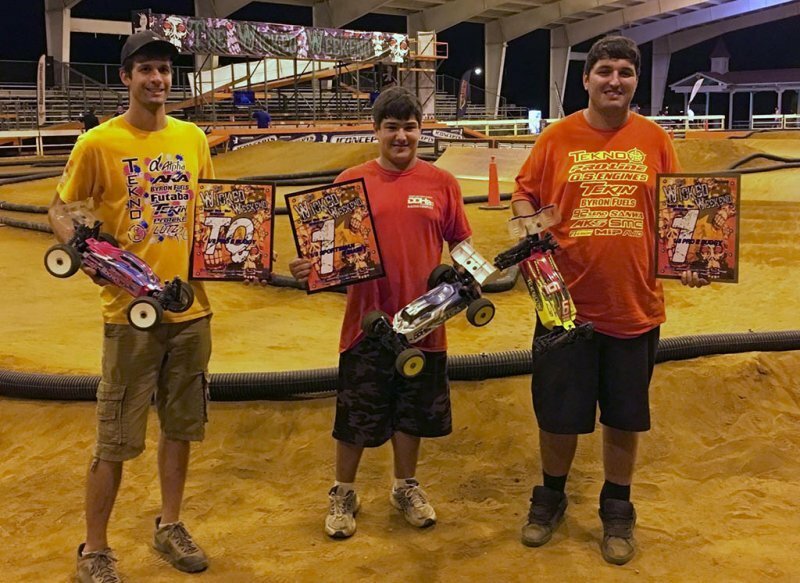 Congratulations Julien Oliveras, winning two of three mains in electric sportsman buggy! 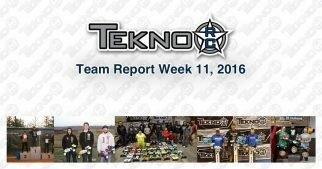 An up and down weekend for the Tekno team but it's racing. We'll come back stronger and try again! Next up for Ryan and Joe is the Pro-Line Shootout at Thornhill Racing Circuit this week.